SHORT WALL | A short wall separates the great room from the foyer. Here, the designer placed a console and, above it, an open lantern light fixture of driftwood and metal with a burlap-covered shade. Gray-washed wicker chairs topped with gray-and-white ikat cushions flank a white oak table with a zinc top in the dining space of the open kitchen. The pale gray walls echo the nearby gray kitchen cabinetry. An abstract piece of art combines grays and yellows. KITCHEN | The designer replaced a small island with a large, triangular version in the open-plan kitchen for optimum function. The color scheme is driftwood gray with Shaker-style cabinetry in gray, a darker gray island and walls of pale gray subway tile. 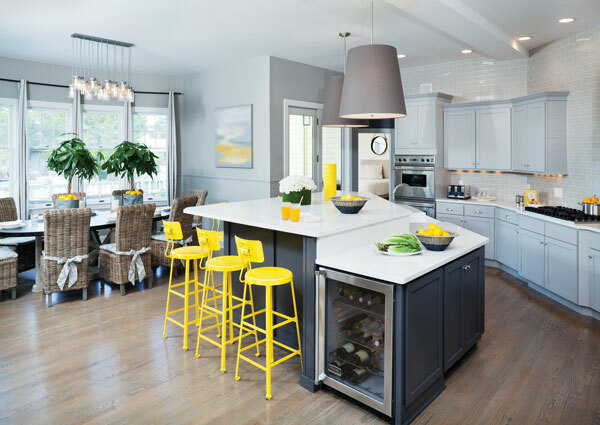 White Caesarstone countertops lighten the space while bright yellow stools at the island provide a fun wow factor. Over the island, oversized pendant lights with linen shades contrast with a whimsical fixture composed of mason jars that tops the table in the adjacent dining space. MASTER BEDROOM | The owners wanted a sleeker look for their master bedroom, and Butler created it with the straight lines of the zinc four-poster bed. The walnut dresser and walnut night stands have warmth but also clean lines. Barrel-backed chairs with yellow accent pillows sit at the foot of the bed. The floor here—and throughout the second floor—is the same driftwood-gray-stained hardwood that’s on the first floor. GREAT ROOM | Tracey Butler chose a “modern, youthful” color palette of gray with vibrant yellow accents for the home’s interiors, including the great room. The space is designed for maximum entertaining with a gray chenille sectional and chairs in a yellow-and-white geometric fabric. Freestanding white lacquer cabinets flanking the fireplace provide storage for media and toys. Bentwood light fixtures hung at varying heights at the center of the ceiling create a cluster light effect and, with their wood finish, introduce a natural element to the space. A driftwood coffee table is another natural touch. 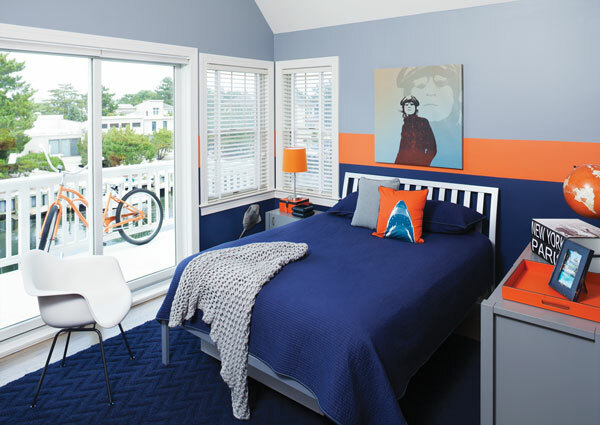 BOY'S BEDROOM | The designer enlivened the gray walls in the boy’s bedroom with a navy-and-orange stripe. The bright orange punches up the other navy elements in the room, including the bedding and the rug. GIRL'S BEDROOM | The young daughter’s bedroom represents a modern approach to a girl’s pink bedroom, Butler says. She paired hot pink accents with aqua walls that evoke the colors of the bay. PATIO | The gray-and-yellow color scheme travels out to the pool patio with its wicker-style resin chairs as well as recliners with yellow accent pillows. The top of the dining table is teak weathered to gray. 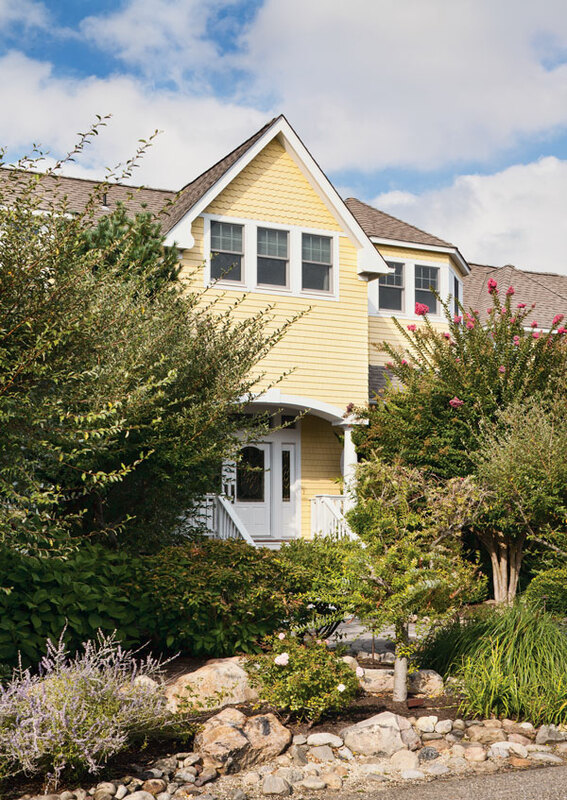 EXTERIOR | This yellow shingle-style Victorian-style home had “serious, dark and traditional” interiors wholly unsuited to a shore getaway for a young family, designer Tracey Butler says. Designer Tracey Butler turns a shore Victorian’s somber, traditional interiors into bright, fun spaces. The bright yellow shingle-style Victorian might as well have been situated in North Jersey rather than on Long Beach Island, New Jersey. When its new owners purchased the house, they called on interior designer Tracey Butler for help in turning the dark, traditional interiors into a home more suitable for its lovely location in Loveladies, NJ. Butler says the interiors didn’t reflect her clients, a couple with two young children. 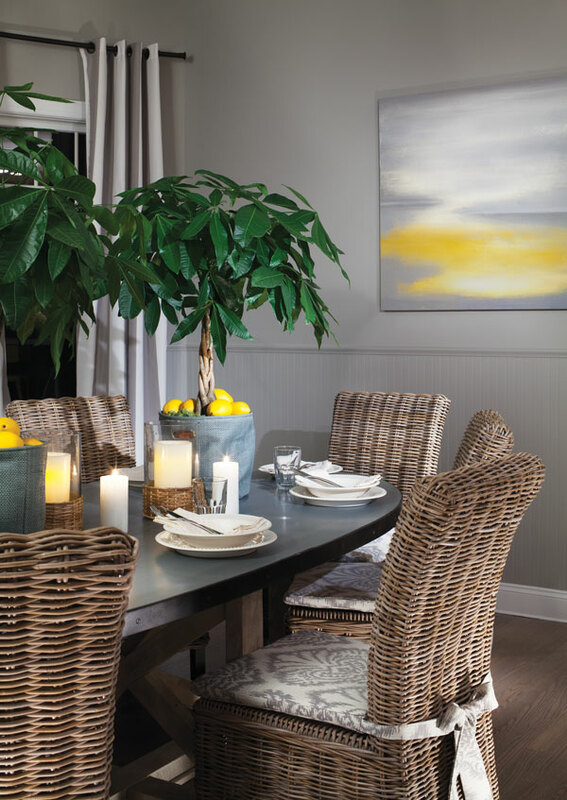 “They wanted to have a feel of the beach—very much a getaway with an almost ocean feel,” says Butler, owner of b.home interior design and r.home interior design in Livingston, a one-stop interior design showroom offering an architect, interior design, appliances, cabinetry, plumbing fixtures, furniture, tile, wall coverings and art. The designer went to work and, as she says, “put a twist on the Victorian and create a contemporary, youthful, whimsical” scheme for the five-bedroom home. The first order of business was to “wipe the place clean,” Butler says. That included removing all finishes, including applied moldings, dark kitchen cabinets and dark wood floors. The designer replaced the latter with driftwood gray stained floors—reminiscent of the driftwood found on the beach—throughout the house. She chose a “modern, youthful palette” of gray paired with yellow. Butler notes gray’s current popularity and says yellow, chosen for its fun factor, has a “purposeful connection” to the exterior of the home. Perhaps the brightest “pop” of yellow is found in the open-plan kitchen, where bright yellow barstools that impart “a whimsical, sunshine feeling” flank a large triangular island that replaced a much smaller island, Butler says. 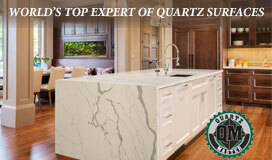 She chose Shaker-style cabinetry in a lighter gray to balance the darker gray of the new island. White Caesarstone countertops and walls of pale gray subway tile further lighten the space. The kitchen opens to the dining room, where gray-washed wicker chairs topped with gray-and-white ikat cushions surround a white oak dining table with a zinc top. The pale gray walls echo the nearby kitchen cabinetry. Butler created an environment for maximum entertaining in the great room, which is also open to the kitchen and bears the same pale gray walls. The large sectional in gray chenille provides ample seating along with chairs upholstered in a yellow-and-white cotton geometric fabric. A bold gray-and-white striped dhurrie rug lies underfoot. The space is crowned by bentwood light fixtures hung at varying heights at the center of the ceiling to create a cluster light effect. Their wood finish introduces a natural element that recurs throughout the home. “I used a lot of natural fibers to make the space as green as possible,” Butler says. The look turns sleek in the master bedroom, where the gray-and-yellow palette forms the backdrop for a space with a more sophisticated, urban vibe. The zinc four-poster bed has sharp straight lines that are echoed in the gray-striped bedding, which in turn evokes the great room’s gray-and-white striped dhurrie. The walnut dresser and walnut side tables are clean-lined and contemporary. Consistent with a beach house, there are white plantation shutters at the windows. Butler also used them in the home’s other bedrooms. The designer departed from gray and yellow in the daughter’s bedroom. It features pink, befitting a young girl, but it’s “a modern approach to a pink girl’s room,” Butler says. Hot pink bedding and accents—along with a stunning pink vintage poster from the 1960s—is paired with aqua walls that recall the colors of the bay. Gray makes a comeback in the boy’s bedroom, but Butler combined it with navy blue and a burst of bright orange. The navy and orange stripes on the gray wall were a fun way to tie in all the colors in the room, she says. A white Eames-style chair is a fit with the bed’s white slatted headboard. Robin Amster, a regular contributor to Design NJ, is a Madison-based writer and editor. Overall: interior design: b.home interior design and r.home interior design in Livingston. Great room: sofa, Room & Board; chairs and light fixtures, West Elm; rug and drapes, Pottery Barn; coffee table, Restoration Hardware; media cabinets, custom, b.home. Foyer: fixture, Curry and Co. in Atlanta; Kitchen: cabinetry and countertops, Taylor Made Cabinets in Manahawkin; wall tile, Wayne Tile; stools, b.home; pendants, Restoration Hardware. Dining room: table, Noir Furniture in Gardena, California; chairs, Safavieh Home in Livingston; light fixture and drapes, Pottery Barn. Boy’s room: Eames-style chair, b.home; all other furnishings, Pottery Barn Kids. Girl’s room: all furnishings, Pottery Barn Kids. Master bedroom: bed and dresser, Room & Board; chairs and rug, West Elm. Pool: furniture, Thos. Baker in Bainbridge Island, Washington.